Fungicides seed dressing provides benefits by preventing fungal infection, conversely, damage the non-target organisms including plant and its symbiotic bacteria. In this study, the effect of two fungicides, carbendazim and thiophanate methyl, was assessed on the growth of pea and its symbiotic bacteria, Rhizobium leguminosarum. In vitro studies revealed that recommended concentration of fungicides did not affect the growth of tested bacteria till the late stationary phase. A field experiment was conducted to evaluate the effect of fungicides and bioinoculants application on nodulation and pod yield of pea. Overall, nodulation and pod yield was significantly improved by the combined application of fungicides and bioinoculants compared to the alone application of either bioinoculants or fungicides. Maximum improvement of 184% in nodule number was achieved by the combined application of R. leguminosarum PS-II and thiophanate methyl, whereas, maximum nodule dry weight of 156% by R. leguminosarum PS-I and thiophanate methyl compared to the control and was highest among the different treatments. On the other side, combine application of R. leguminosarum PS-I and carbendazim was found best by increasing 43% podyield over control. The study revealed that symbiotic bacteria have the ability to resist fungicide treated environment and combined application of fungicides and bioinoculants is a useful strategy for improved growth of pea. Fungicides, Pisum sativum, Pod yield, Symbiotic bacteria. Ever-increasing population of the world demands a massive increase in the crop production. Although, the agriculture output is doubled in the past four decades, largely because of the widespread use of synthetic chemical fertilizer and pesticides as well as by improved irrigation techniques. But this increase in crop production is unsustainable due to environmental impacts of current practices . Sustainable agriculture seeks to increase crop yield while reducing the cost associated with the environment. Integrated pest management is a farming practice promotes the use of biological as well as chemical means to improve plant growth and control disease . Fungicides seed treatment is a very common practice recognized as a useful strategy to combat seed-born pathogens and seedling damping-off agents. In Pakistan, Darosal (carbendazim) and Topsin (thiophanate methyl) are widely being used to control fungal diseases. Both the systemic fungicides, carbendazim and thiophanate methyl belong to benzimidazol group. These fungicides are used to control a wide range of fungal diseases including eyespots, mould, mildew, scorch, rot and blight in a variety of crops . The antifungal activity of these chemicals is based on the blockage of nuclear division during mitosis and destabilization of fungal cell structures, which ultimately cause the inhibition of germ tube development, appresoria formation and mycelia growth . Current understanding of nature and magnitude of possible effects of fungicide application on legume crop is incomplete and in some instances research results are somewhat controversial. Fungicides may influence plant growth either by affecting symbiotic bacteria, plant growth or interaction of both partners [5,6]. Chiefly, fungicides mimic naturally occurring biochemicals in the rhizosphere and thereby interfere with symbiotic signaling between rhizobia and host legume. Inhibited or delayed recruitment of rhizobia to host plant roots, poor nodulation, lower rate of nitrogen fixation and a reduction in plant biomass and grain yield are the possible harmful effects of fungicide [1,7,8]. Unpleasant results of fungicides application are largely due to the poor understanding of various factors including fungicide-inoculant compatibility, crop varieties, environment and interactions of these factors. A sound awareness of these factors would guide in making appropriate inoculant strategies to maximize the benefits of rhizobia-legume association. In this study, we evaluated the effect of carbendazim and thiophanate methyl fungicides on the growth of Rhizobium and Agrobacterium, on nodulation and pod yield of pea. The experiments were conducted in the laboratories and fields of National Institute for Biotechnology and Genetic Engineering (NIBGE), Faisalabad, Pakistan. Plant growth promoting rhizobacterial strains, Rhizobium leguminosarum PS-I, Rhizobium leguminosarum PS-II and Agrobacterium sp. Ca-18 were obtained from the BIRCEN culture collection, NIBGE. All bacterial strains were grown individually in Yeast Extract Mannitol (YEM) broth at 28 ± 2°C. Seeds of pea cultivar Mateore were purchased from Ayub Agriculture Research Institute (AARI), Faisalabad, Pakistan . Fungicide containing the active ingredients, carbendazim (Darosal® 500SC, Aventis, Pakistan Crop Sciences, Pakistan (Pvt) Ltd) and thiophanate methyl (TOPSIN-M® 70WP, Arresta Agro, Pakistan (Pvt) Ltd), were used in this study. In vitro effect of fungicides on bacterial growth was assessed according to Singh and Wright with some modifications. YEM supplemented with carbendazim and thiophanate methyl at a concentration of 0.7 ml/L and 1 g/L, respectively, and YEM without any modification (control) was prepared in a 100 ml flask containing 24 ml media. Media was inoculated with 1 mL of bacterial cultures maintained at 107 cfu/ml and incubated at 28 ± 2°C at 150 rpm. Growth of bacteria was measured at periodic incubation periods as optical density (OD) at a wavelength of 650 nm with spectrophotometer which was calibrated with uninoculated blank. Pea field experiments were conducted in 2009. There were fifteen treatments and three replicates arranged randomized complete block design (RCBD). Selected fungicides carbendazim and thiophanate methyl were applied in combination with bacterial inoculants on pea cultivar mateore. All the selected bacteria were used to inoculate as single strain and composite inoculum. Seeds were surface sterilized with 0.1% mercuric chloride for 10 min, then washed six times with sterile distilled water. Surface sterilized seeds were first treated with fungicides at recommended rate, Topsin @ 2 g/kg seed and Darosal @ 2 μl/kg seed. Upon drying of seeds, bacterial inoculants maintained at 107 cfu/ml in distilled water were applied at the rate of 10 ml/100 g seeds and each treatment sown in a plot of 2 m × 6 m. Soil of the experimental area was prepared before sowing by applying half recommended dose of fertilizer, diammonium phosphate (25 kg of DAP per acre). During 4-5th week of sowing, plants were harvested to record nodulation, while mature plants were harvested after four month to record seed yield. The data were analyzed statistically using MSTAT software. Analysis of variance was computed and means were compared employing LSD test . Over 90% of the synthetic chemical pesticides reach destinations other than their target and cause severe destruction to biotic and abiotic components of the environment. In agriculture, these chemicals severely affect plant growth directly by disrupting plant metabolism and indirectly by killing plant-pollinating insects and disrupting nitrogen-fixation systems . Symbiotic nitrogen fixation is disrupted by the application of chemical pesticides either by their interference in plant-microbe signaling or affecting metabolic activities of plant and/or bacteria. Generally, pesticide levels that are encountered in the field have minor detrimental effects on growth and development of bacteria or plant, but their concentration beyond the threshold level is extremely harmful . This harmful effect is more pronounced when these chemicals impair symbiotic signaling which is essential for leguminous crops . In this study, it was observed that the growth of PS-I remained unaffected with the application both the fungicides till the stationary phase (Figure 1). Growth of PS-II also showed a similar trend (Figure 1b). Both the carbendazim and thiophanate methyl did not exhibit any inhibitory effect on the growth of PS-I and PS-II. Growth pattern of Agrobacterium sp. 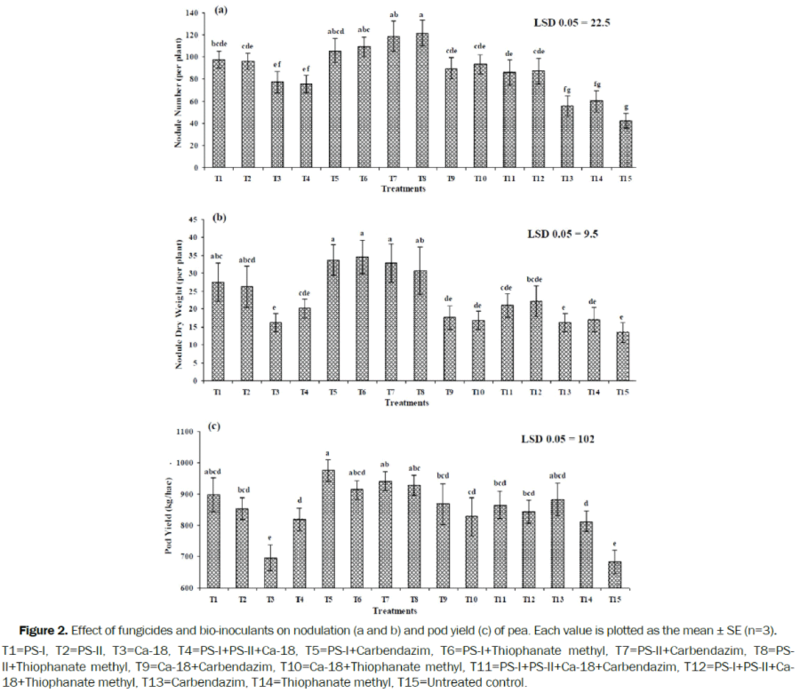 Ca-18 was observed after regular intervals of 6 h. It was found that both the fungicides had no inhibitory effect on the growth of Ca-18 till the late stationary phase (Figure 1c). Overall, the results of In vitro toxicity of fungicides on bacterial strains revealed that both fungicides did not inhibit the growth of all the tested bacteria . Moreover, it was observed that during the early growth phase both the fungicides showed some toxicity against all the tested bacteria (Figure 1a-1c). Generally the tested fungicides were compatible with the bacteria and do not have significantly adverse effects on its growth. Microbes are the key component for the removal of pollutants from the environment. That is why, microbes are able to withstand fungicide-stressed environments and play a major role in bioremediation . It might be the reason that bacteria are not harmed by most of the tested fungicides and can thrive even in the fungicide-polluted environments. Figure 1: Effect of carbendizm and thiophanate methyl on the growth of Rhizobium and Agrobacterium: R. leguminosarum PS-I (a), R. leguminosarum PS-II (b) and Agrobacterium sp. Ca-18 (c). Each value is plotted as the mean ± SE (n=3). There was a highly significant effect of treatments on nodule number (Figure 2a). Bioinoculants application significantly increased nodule number compared with the fungicide treatments. Among bio-inoculant treatments, both the strains of R. leguminosarum PS-I and PS-II resulted in increased nodule number than Agrobacterium sp. Ca-18 and consortia inoculation. Among combined inoculation of bioinoculants and fungicides treatments, again R. leguminosarum PS-I and PS-II showed increased nodule number. PS-II+fungicides performed better than PS-I+fungicides. Combine application of bioinoculants and fungicides performed better to increase nodule number compared with the bio-inoculant or fungicide alone. Application of R. leguminosarum PS-II+thiophanate methyl significantly improved nodule number (122) and was highest among the different treatments. Recently, Patil reported the increased plant growth, protein, carbohydrates and chlorophyll contents of Stevia rabaudiana by the combined application of chemical fertilizers and biofertilizer . Smaller nodule were observed in Agrobacterium sp. Ca-18 treatment. Nodules dry weight was also significantly increased by different treatments (Figure 2b). There was a similar trend of nodules dry weight to the nodule numbers, except the combined inoculation of R. leguminosarum PSI+ fungicides, which significantly improved nodule dry weight. Application of R. leguminosarum PS-I+thiophanate methyl significantly improved nodule dry weight (34.5 mg) and was best among the different treatments. Generally, there was a significant improvement in nodulation by the application of bacterial inoculants, but the increment with the fungicides alone treatments was not statistically different from un-inoculated control (Figure 2a and 2b). This improvement in the nodulation by the bioinoculants was due the nitrogen fixing symbiosis and growth promoting activity of rhizobial inoculants . However, an insignificant increase in the nodule dry weight was observed by the inoculation of A. tumefaciens Ca-18 compared with the un-inoculated control. Nodulation in A. tumefaciens Ca-18 and un-inoculated control was due to the presence of indigenous rhizobial population in the field. It was also observed that nodule numbers insignificantly improved in fungicides alone treatment, which might be due to the cytokinin like growth regulatory activity of benzimidazole fungicides . Figure 2: Effect of fungicides and bio-inoculants on nodulation (a and b) and pod yield (c) of pea. Each value is plotted as the mean ± SE (n=3). There was a highly significant effect of treatments on pod yield of pea (Figure 2c). Combined application of R. leguminosarum and fungicides performed better. R. leguminosarum PS-I alone inoculantion produced better pod yield among bioinoculants treatments. Application of R. leguminosarum PS-I+carbedazim was found best among the different treatments with 43% pod yield increase compared with the un-inoculated control. Overall, the treatments of bioinoculants and fungicides and bioinoculants alone performed better to improve nodulation and plant yield [13,16]. Among these treatments, rhizobial inoculation showed higher crop yield than the A. tumefaciens Ca-18 consortia and mixed culture inoculation treatments. There was no harmful effect of fungicides on pea microsymbiont, R. leguminosarum, In vitro. The results of field were also in accordance with the In vitro assay, as there was remarkable improvement in nodulation and pod yield in combined treatments of fungicide and bioinoculants compared to bio-inoculant alone. Fungicides alone also improved the grain yield compared to control, but less than inoculation treatment. A significant increase of 34%-43% in pod yield was achieved in the combined treatments of R. leguminosarum and fungicides compared with the un-inoculated control (Figure 2c). Previously, Gaind et al. reported that combined application of fungicide and bioinoculants improve root and shoot biomass and grain yield. Hence, combined application of fungicides and bio-inoculants has the ability to control fungal diseases, fulfill plant nutritional requirements and ultimately promote plant growth. Data recommend the combined use of fungicides and compatible bacterial inoculants based on the rational selection of fungicides and beneficial microorganism . A large number of evidences are available that bacteria have the ability to withstand the fungicides tainted environment [6,18]. In the same manner, there is a plenty of data showing that chemical pesticides disrupt the symbiotic signaling between the rhizobia and the legume, which ultimately reduce the nodulation and grain yield [1,19]. Hence, synthetic pesticides should either be avoided in legume cultivation or used based on the detailed understanding of various factors including fungicide-inoculantcrop compatibility. In the present study, we for the first time report that pea symbiotic bacteria have resistance against the benzimidazol fungicides and significantly improve pea nodulation and pod yield upon their combined application. The authors would like to acknowledge Mr. Asghar Ali and BIOPOWER team for their help in carrying out field trial. This study was funded by Agriculture Linkage Program (ALP), Pakistan. Fox JE, et al. Pesticides reduce symbioticefficiency of nitrogen-fixingrhizobia and host plants. Proceedings of theNationalAcademy of Sciences of theUnitedStates of America. 2007;104:10282-10287. Wallingford AK, et al. Harlequin Bug Biology and Pest Management in BrassicaceousCrops. J Integ Pest Mngmt. 2011;2:1-4. CycoÅM, et al. Biodegradationkinetics of the benzimidazole fungicide thiophanate-methylby bacteria isolatedfromloamysandsoil. Biodegradation. 2011;22:573-583. Roberts TR, et al. Metabolicpathways of agrochemicals: insecticides and fungicides. Royal Society of Chemistry, Great Britain.1998;1134-1137. Martensson AM. Effects of Agrochemicals and Heavy-Metals on Fast-GrowingRhizobia and TheirSymbiosis with Small-SeededLegumes. Soil Biol. Biochem. 1992;24:435-445. Singh G and Wright D. In vitro studies on theeffects of herbicides on thegrowth of rhizobia. Lett Appl Microbiol. 2002;35:12-16. Fox JE, et al.Phytoestrogen signaling and symbiotic gene activation are disruptedbyendocrine-disruptingchemicals. EnvironHealthPerspect. 2004;112:672-677. Fox JE, et al. Nitrogenfixation. Endocrinedisrupters and flavonoid signalling. Nature. 2001;413:128-129. Vincent JM (1970). A Manual forthePracticalStudy of theRoot-Nodule Bacteria. BlackwellScientificPublications. London. Steel RGD and Torrie JH. Analysis of covariance, In: Principles and Procedures of Statistics: a BiometricalApproach. McGraw-Hill, New York. 1980. Bikrol A, et al. Response of Glycinemax in relationtonitrogenfixation as influencedbyfungicideseedtreatment. Afr J Biotechnol. 2005;4:667-671. Kalwaslińska A, et al. Biodegradation of carbendazim byepiphytic and neustonic bacteria of eutrophicChełmzyńskie Lake. Pol J Microbiol. 2008;57:221-230. Patil NM. Biofertilizereffect on growth, protein and car bohydratecontent in Steviarebaudianavarbertoni. Recent Res Sci Technol. 2010;2:42-44. Bhuiyan MAH, et al.Effects of inoculation with Bradyrhizobium on nodulationpattern, nodulesenescence and sizedistribution in mungbean. Bangladesh J Agril Res. 2007;32:269-282. Debergh PC, et al. Carbendazim as analternativeplantgrowthregulator in tissue culture systems. In Vitro Cell. Dev-Pl. 1993;29:89-91. Kumar V, et al. Efficacy of fly-ashbasedbio-fertilizers vs perfectedchemicalfertilizers in wheat (Triticum aestivum). Int J Eng Sci Technol. 2010;2:31-35. Gaind S, etal. Survival of bio-inoculants on fungicides-treatedseeds of wheat, pea and chickpea and subsequenteffect on chickpeayield. J Environ Sci Health B. 2007;42:663-668. Mubeen F,et al. In vitro investigationsto explore thetoxicity of fungicidesforplantgrowthpromoting rhizobacteria. Pak J Bot. 2006;38:1261-1269. Fox JE. Non-traditional targets of endocrinedisruptingchemicals: theroots of hormone signaling. IntegrComp Biol. 2005;45:179-188.